You can't see Radon Gas. You won't smell or taste Radon. 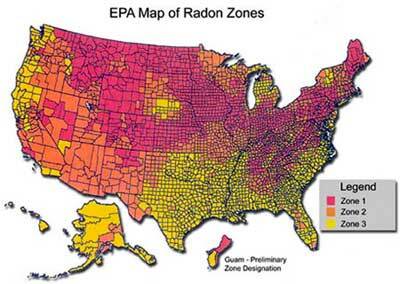 Radon enters the air you breathe from the natural (radioactive) breakdown of uranium in soil, rock, and water. It can be found in any type of building - your home, your office, and even in schools. Radon gas can accumulate and increase the effects of exposure. Indoor Radon is the second leading cause of lung cancer in the United States and the leading cause of lung cancer among non-smokers. It is estimated that radon causes many thousands of deaths each year. The EPA, working in concert with Federal, State, and local governments as well as volunteer organizations, conducts many different programs to educate Americans about the indoor radon health threat. About 1 in 15 homes has high radon levels. Performing a radon test is the only way to measure radon exposure and identify the risk to you and your family. The EPA and Surgeon General recommend conducting a radon test on all homes, second floor and below.